Servlet 3 File Upload Example using MultipartConfig shows you how to handle file upload with Servlet 3. This is additional feature that Servlet 3.0 Specification supports it out of the box. Thus, a annotation @MultiPartConfig has been introduced in Servlet 3.0 Specification. This annotation can be used to annotate a servlet class in order to handle request of type multipart and configure other upload file settings. Servlets that are annotated with MultipartConfig can retrieve the Part components by calling the request.getPart(String name) or request.getParts() method. 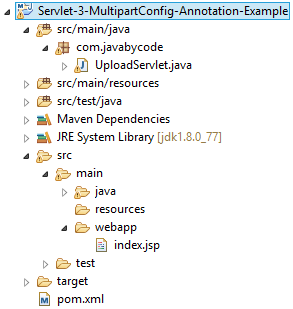 This is thirteenth post of series of Java Servlet Tutorial. This series tutorial will provide you full knowledge about Servlet 3.0.
location: An absolute path to a directory that ised to store files temporarily. This attribute does not support a path relative to the application context. The default location is “”. fileSizeThreshold: If the upload file’s size is greater than this threshold, it will be stored temporarily in disk. Otherwise the file is stored in memory. Size in bytes and the default value is 0 bytes. MaxFileSize: The maximum size of uploaded files, in bytes. If the size of any uploaded file is greater than this size, the exception (IllegalStateException) will be thrown. The default size is unlimited. maxRequestSize: The maximum size of multipart/form-data request, in bytes. The exception will be thrown if the overall size of all uploaded files exceeds this threshold. The default size is unlimited. The getParts() method returns collections of all Part objects. If form has more than one input of type file, multiple Part objects are returned. That’s all on the tutorial Servlet 3 File Upload Example using MultipartConfig. You can also find other servlet example in the series of Java Servlet Example.